Growing up, I saw museums as entities with a set of of rules to follow, such as talk quietly, dress nicely, and refrain from touching artwork or taking pictures, which can be at odds with creating a welcoming environment for all audiences. 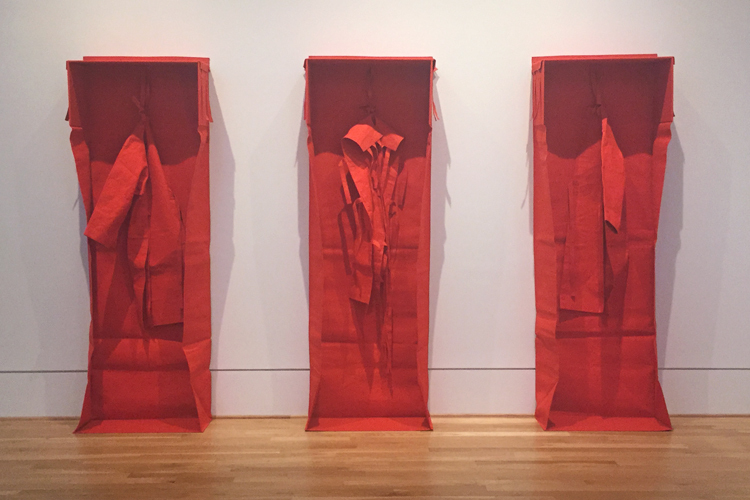 However, one work at the Phillips caught my attention as a good example of how present-day museums and artists are attempting to break this standardization of rituals by having visitors create their own aesthetic experience through interactive art: Red Song by Franz Erhard Walther. Walther produces works, often in primary colors and out of ordinary heavy canvas, that are reminiscent of minimalist compositions, and is recognized for his early investigation of participatory art. Using fabric forms (which he first developed in the 1960s), the artist invites visitors to engage with his work, emphasizing the temporal and experimental aspects of art. This is the case for his piece Red Song, currently on view in a gallery showcasing recent acquisitions. This is a multi-part blog post; check back in the following weeks for parts 2, 3, and 4.